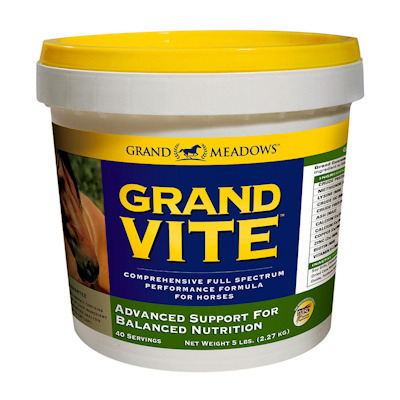 Grand Vite (Grand Meadows) is a premium vitamin-mineral supplement with antioxidants. Formulated for high performance horses, breeding mares, mares in lactation, stallions and during times of stress, surgery or physical trauma. Contains high levels of vitamins A,D3,E,B-complex, chelated minerals, yucca, probiotics and dry live yeast cultures to enhance absorption. Feed 1 or 2 ounces daily depending on the level of activity of the horse. Very palatable product.